Yesterday, Kellen and myself got back to the hotel and immediately started messing around with Google’s new Hangouts app. While attempting to make a video call over mobile data on AT&T’s network, we got the following message, “You must be connected to a Wi-Fi network to join a video call.” Well, that’s a downer. We saw this issue awhile back when AT&T still blocked Apple’s FaceTime feature on iPhones, so there is always the possibility that this block could get lifted. We should note that we attempted this on Verizon’s network as well and it worked with no issues. 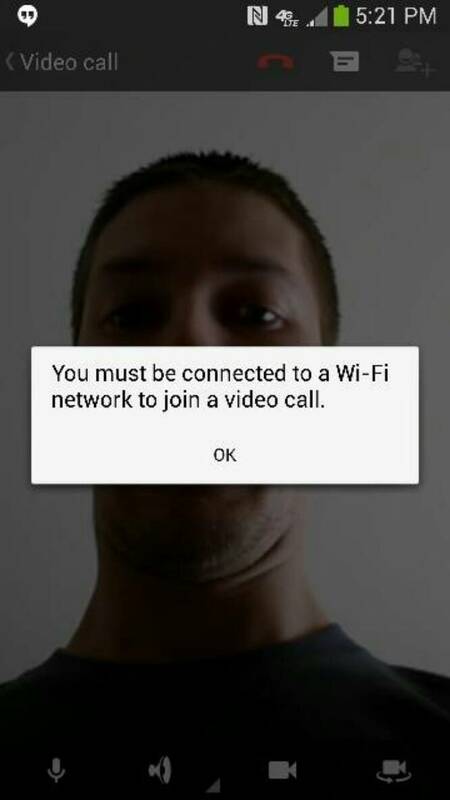 With WiFi hotspots almost everywhere you go, this shouldn’t stop too many people from enjoying Hangouts.